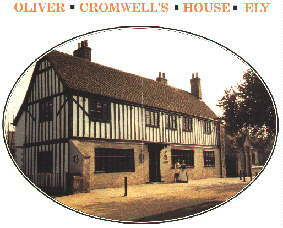 CROMWELL HOUSE - TOURIST INFORMATION CENTRE FOR ELY U.K. This is the only remaining house other than Hampton Court where Oliver Cromwell and his family are known to have lived. The present east wing represents what is left of the original 13th century building. The house is some 750 years old and it has had a varied history. In the 1840's it was a public house aptly called "The Cromwell Arms" and from 1905-1986 it was the vicarage for the adjoining St. Mary's Church. Inside several rooms have been refurbished in Cromwellian style and an audio visual presentation gives an insight into the domestic, military and political aspects of his life. The Tourist Information Centre is located downstairs and is unique in its period style and atmosphere. Click here for close-up of the two models/dummies outside Cromwell`s House. The centre can help with advice, leaflets, guide books, maps and information to help you to get the best from your visit to this area. Both the local bed booking service and a "book a bed ahead" service are available. In addition, the centre has a wide range of attractive souvenirs, postcards and gifts. 29 St. Mary`s Street, Ely, Cambridgeshire. CB7 4HF.